The FTSE 100 Price is currently 6,338 which is a gain of 5.2% on the 01 January 2013 Price of 6,027 and 9.5% above the 01 February 2012 Price of 5,791. The FTSE 100 Dividend Yield is currently 3.47% which is down against the 01 January 2013 yield of 3.64%. 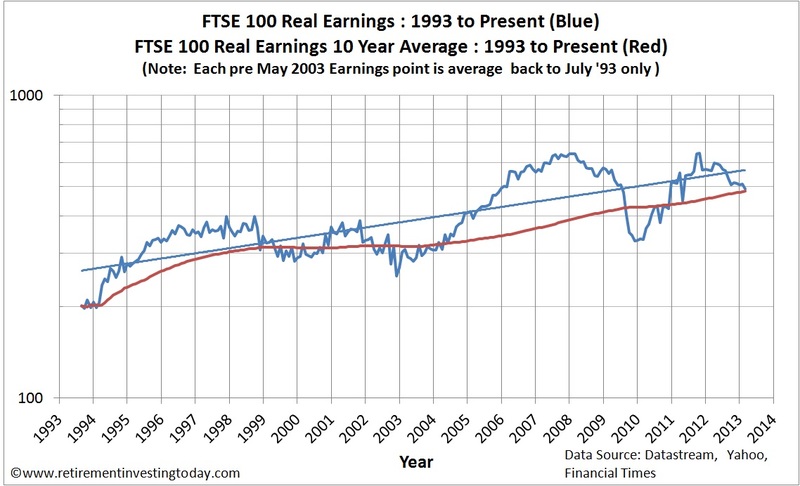 The FTSE 100 Price to Earnings (P/E) Ratio is currently 12.96. The Price and the P/E Ratio allows us to calculate the FTSE 100 As Reported Earnings (which are the last reported year’s earnings and are made up of the sum of the latest two half years earnings) as 489. They are down 4.6% month on month and down 11.7% year on year. The Earnings Yield is therefore 7.7%. So we find ourselves in an interesting situation. Nominal Earnings are falling and have been consistently since October 2011’s Earnings of 628 yet Prices are rising. FTSE 100 PE10 is 13.1 which is up against the 01 January 2013 PE10 of 12.5. The FTSE 100 Average PE10 is 19.1. Assuming this is “fair value” it indicates that the FTSE 100 is 31% undervalued. As I always say I don’t actually believe this and think that this is a function of the fact that the dataset is quite short but more on this later. The correlation between the FTSE 100 Price and the FTSE 100 PE10 is 0.22. This is considered a weak or low correlation. 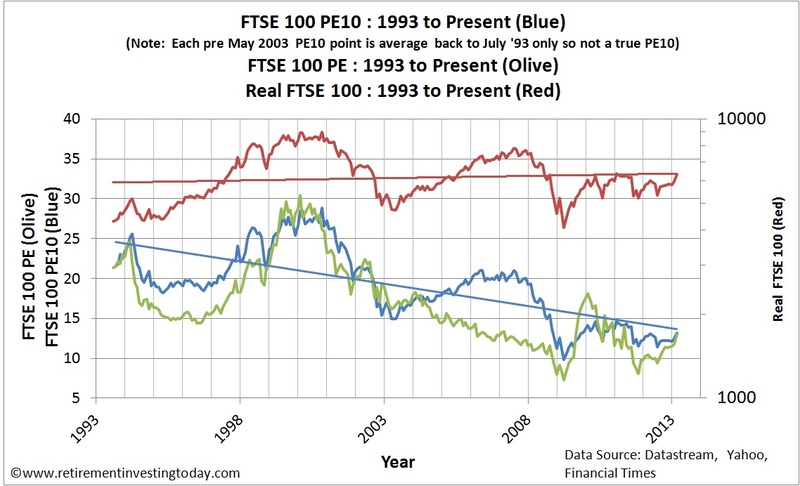 The correlation between the FTSE 100 Real Price and the FTSE 100 PE10 is a much more impressive 0.66. This is considered a moderate correlation bordering on a strong or high correlation. 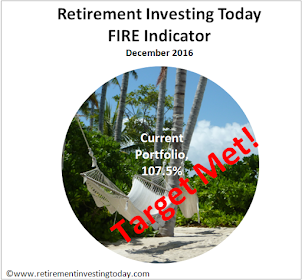 The chart below is why I use the FTSE 100 CAPE to drive a tactical portion of my Retirement Investing Today asset allocation. 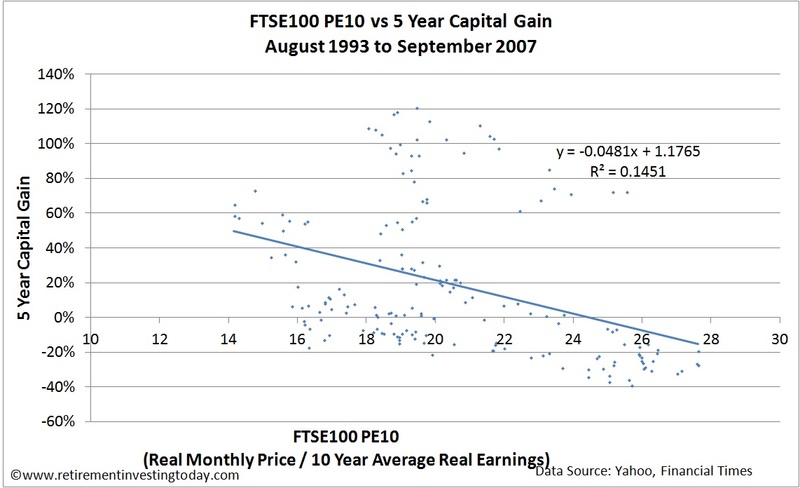 It shows the relationship between the FTSE 100 PE10 and the Nominal 5 Year Capital Gains from August 1993 to February 2008. Ideally this would be a 5 Year Total Return Chart, ie including dividends, however this dataset is not yet mature enough to allow this given my dividend data only goes back to 2006. Even so just looking at 5 Year Nominal Capital Gains we see a correlation of -0.46 with an R^2 of 0.15 which is considered moderate. With the FTSE 100 PE10 at 13.1 the trendline suggests a future Nominal 5 Year Capital Gain of 54%. In contrast the Real (inflation adjusted) 5 Year Capital Gain (not charted today) trendline implies a return of 37%. While I am making investment decisions from this FTSE 100 CAPE data I have a problem in that the dataset is quite short. To correct for this I make a large assumption which is that there is a high level of correlation between UK Equities and International Equities. Tim Hale in his excellent book Smarter Investing: Simpler Decisions for Better Results shows a table which suggests this correlation could be as high as 0.9 which is a very strong correlation. Therefore if I look at my mature S&P 500 dataset it shows that from 1881 to present we have seen an average PE10 of 16.5 and from 1993 to present (the length of my FTSE 100 dataset) we have seen a much higher average PE10 of 26.4. If I ratio these two numbers and multiply by the PE10 Average from my FTSE 100 dataset I can get a pseudo “long run” Historic FTSE 100 PE10. Doing the maths this is (16.5/26.4)x19.1=11.9. Comparing that number with today’s PE10 of 13.1 suggests an 11% over valuation compared with the 31% undervaluation presented earlier. It is this relationship that I am basing my own personal investment decisions on and so with the market continuing to become slightly over valued I am being forced to lighten up and am now targeting an allocation of 19.3% of total assets towards UK Equities as my tactical allocation compared with a nominal strategic allocation of 20% of total assets. - UK CPI inflation data for February 2013 is estimated. I am no maths buff so I am impressed by your ability to work the above figures and percentages! One aspect leaves me a little confused which is the reducing of your UK allocation from 19.6% in December to 19.3%. I imagine that the majority of your UK will consist of large FTSE 100. Although listed in London, most companies will derive a large percentage of their profits from all corners of the globe - maybe 80%. In one sense, they could equally be part of your international allocation. I suppose I'm left wondering whether there is much distinction between the two? If equities and returns are closely correlated, maybe one global equity low cost tracker would suffice? By the way, the costs on that Vanguard UK tracker are hard to beat! My UK Allocation is currently a majority allocation to the FTSE All Share using the Vanguard fund you mention. Agreed very attractive costs. Additionally I have my HYP which is in its infancy covering FTSE100 companies. My technique here is not related to where the profits come from but is simply about Earnings over a "business cycle" (10 years), rather than a year as is the case with PE and then comparing current Pricing to those Earnings. I then look at history to compare this current PE10 with the average PE10 over the length of my dataset (including some extrapolation). It's nothing more than an attempt to mechanically (rather than emotionally) value the market. To your question. If I was just starting out today I'd be very tempted to just buy a single Vanguard LifeStrategy Fund that reflected my risk tolerance today based on my age, then derisk it with a Vanguard Bond Fund each year on my birthday. Stick it all in a low cost Pension/ISA and the job would be done. That would probably give me more than 95% of what I'm currently achieving in terms of performance. "The negative to this... 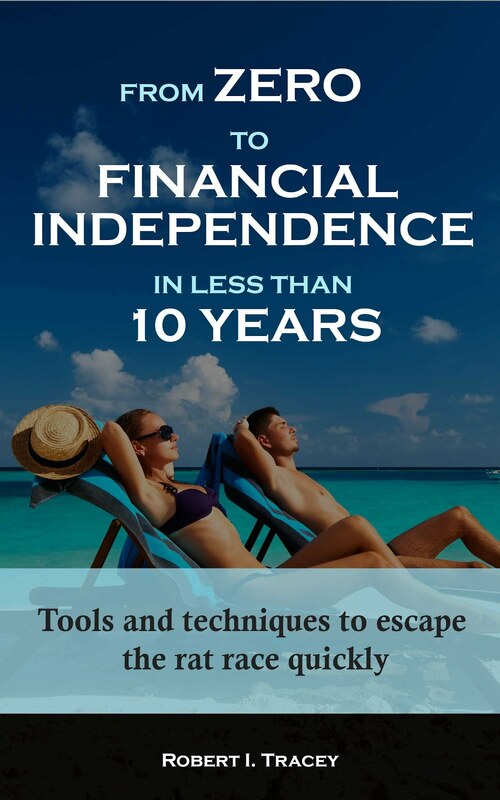 Portfolio management would then take about 15 minutes a year which would mean I wouldn't need this Site and I would be looking for a new hobby :-)"
Thanks John for your work on a 10 year and longer than present annual scenario. I've begun to look at it for the past 3 months and find it useful. Please keep up your hobby!